A close up example of the robotic fish in water. A group of researchers at Georgia State and New York University are designing an underwater robotic fish. The potential of the fish can be used to influence actual schools of fish, and save them for disasters like oil spills. By combining research and mathematics, Associate Professor for the Department of Mathematics and Statistics at Georgia State Igor Belykh, hopes to create a solution for some of the major challenges of the robotic fish project with his team. In order for the robotic fish to be successful it must mimic the behavior of a real fish. If researchers are able to create a convincing mechanical fish. 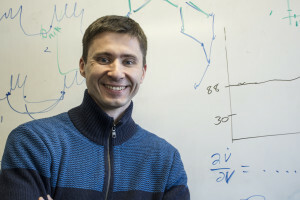 Associate Professor Igor Belykh, who is helping with solving problems the robotic fish project faces, poses in front of a board of his own equations. “The final product should be the school of robotic fish that we can effectively control, that can move all together and never break the formation, this is the technological part, the biological part is to sell this to real fish,” Belykh said. One of the challenges is creating a network that will allow the school of mechanical fish to communicate with one another. Once a connection is made, the robots can be controlled and told where to move. Q: What are some challenges that you have to take into consideration with your research? Belykh:There are two problems, one is the biological problem and other is the robotics, the biological problem is to make sure that the robot you’re creating will be good enough to attract real fish. When it comes to the small school of fish one robot is enough. It depends on the color, the size of the robot and the frequency of it’s tail. It’s very tricky, like following the leader, you really need to sell it to the fish first. Q: How will the programmed fish mimic a real school of fish? Belykh:The second problem, if we need to guide the real school of fish we need multiple robots. The fish feel safe when they’re closer to a big crowd. We need multiple robotic fish to swim together forming our crowd. There is lots of technology problems, they need to swim in the formation and this formation must turn needs in sync. Under water, the communication is much weaker, and there’s lots of the things that prevent reliable communication. Q: Will the robotic fish be able to record information? Belykh: The Robotic fish must exchange the information of it’s location and speed, so it’s done through the chip, but the problem is that is exchange of information should not be too frequent, to save the battery life. There is a trade off between the ability to swim information and the frequency of information exchange. Q: How will the school of fish know where to go? Belykh:They need to keep formation, and then they need to follow the trajectory the we want. We’re telling the leader that it must swim that way and all the other robotic fish needs to be in sync with the other. 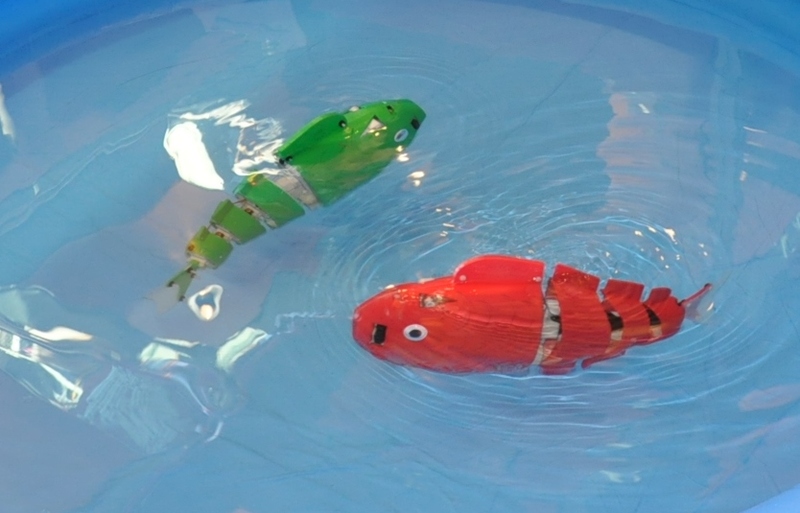 Q: Can the robotic fish communicate with each other? Belykh:Here comes the concept of network, it’s pretty much a network which changes its structure. If you think of the social network we’re all connected among each other. So these guys also connect when they send signals, when they change the information they need to get closer to each other. Q: What does the mathematical research accomplish? Belykh:It’s fundamental mathematical problem, the algorithm, and so that’s what we work on as applied mathematician. We’re tying to develop the technique that mold the fish in the fish in the way of controlling the robots. By using what is called dynamical systems, it’s mathematical molds, differential equations which get implemented into the chip. What to implement is a big deal. This is what we call the theory of evolving dynamical networks, because it’s effectively evolving network because it changes the structure. Belykh: At this point we are developing a theory, we’re actually writing a paper with my research. We discuss solving the consensus problem, because the consensus problem in control theory.We’re all following the same paths, we’re all swimming in the formation, we’re all doing the the same thing and so we’re all having the consensus of doing the same thing. We’re solving the consensus problem among the moving agents in those robots, and the control theory are called agents. There moving and then they get together and form the connection within the specific neighborhood. Q: Why are the connections important to the success of the robotic fish? Belykh:These connections are switching on and off, and the frequency of the information exchange, trying to find an optimal switching range which gives the tradeoff between the recession of the consensus movement and the battery life. This research is funded by a U.S Army Research Grant. The size of the robotic fish ranges from three inches to 10 inches, big fish are an important part of this network. With larger fish the school can feel protected. “We are in the very beginning, so this is the first year of this grant and my research is also part of it, the robot has evolved, it exist in different sizes,” Belykh said. 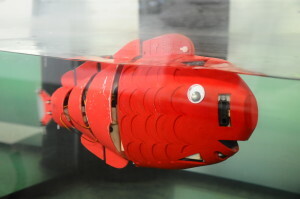 When a sufficient model of the robotic fish is created, the team would like to demonstrate its potential to the public. In the not so distant future Belykh and his team is thinking of setting up a displaying by partnering with the Georgia Aquarium. The school of robotic fish could be used an an education tool to teach high school and STEM students about the tangible use of applied mathematics. Dr. Belykh welcomes students who are interested in helping with the project. Its no surprise that technology and research has led to the evolution of robotics. Other popular robotic animal like Cheetah, created by Boston Dynamics, has the ability to sprint about 29 mph, according to organization’s website. Flying machines, have gotten smaller and more durable. Drones come in various shapes and sizes, some are used by hobbyist and military personnel, and for the right price they can be purchased online. The use of drones are endless. Some of them have camera that can capture or record aerial footage. Researchers are using applied mathematics to create programs that make drones more durable. Future concepts have gone so far to include drones that can deliver food, or provide quicker life saving assistance. The da Vinci, is a robotic system designed to aid doctors in delicate procedures. The small hand-like instrument can get into tighter places compared to the human hand. The surgical robot uses a camera magnify parts of the body, which allows doctors to perform less invasive surgeries.